Libraries are places to learn and connect. You can escape your woes among the many pages of modern releases or find new knowledge amidst ancients times. A library is like a real life ‘choose your own adventure’ story; everyone walks in through the same doors, but each visitor will find their own path through the stories and facts of legend. 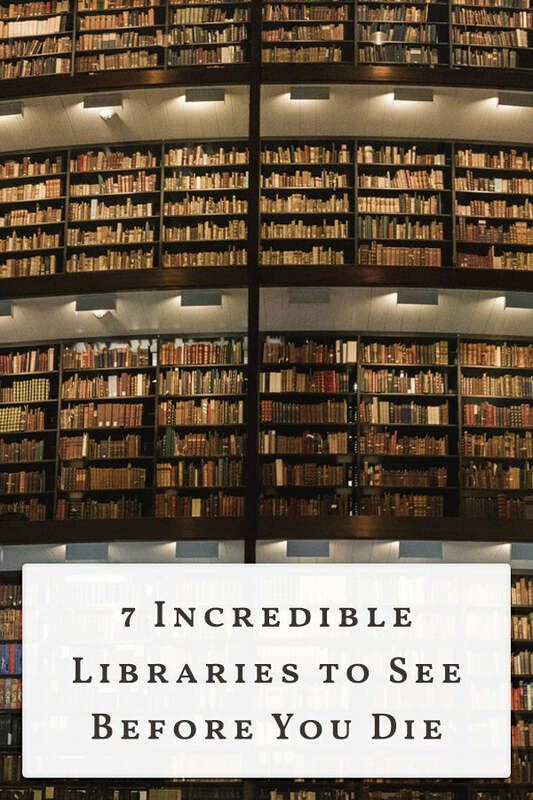 Now that we’re done waxing poetic about our love of libraries, let's move onto the good stuff; seven incredible libraries to see before you die! And while that may seem a little drastic, the collection of libraries that we have gathered below are all bucket list worthy. Here are some of our favorite libraries, and heads up, you may see one or two sites that inspired some of our book themed candles. All politics aside, the Library of Congress is the largest library in the world. It houses millions of books, recordings, photographs, newspapers, maps, and manuscripts amongst its many collections. And a hidden treasure clue or two. Just kidding. Maybe? The Library of Congress is a sight to behold, with nearly 532 miles of bookshelves housed within its hallowed halls. The Library’s collection is regarded as “the world’s most comprehensive record of human creativity and knowledge.” Not only does the Library boast an impressive literary collection, but they offer rotating and visiting exhibits that rival the best museums of the world. The Library of Congress has got to be a bucket list item for any true bibliophile. You may not be familiar with the Sterling Memorial Library, but you’ve undoubtedly heard of Yale, the famous ivy league school in New Haven, Connecticut. The Sterling Memorial Library is arguably one of the jewels of the Yale Library network and is housed in the heart of the Yale campus; which is why you’ll find the inscription “The Library is the heart of the University” engraved above its door. The Sterling Memorial Library stands out with its unique, elaborate interior and exterior, which features hundreds of sculptures, paintings, and panes of stained glass. In total, the library has over four million volumes within its sixteen levels of bookstacks. You thought Yale would only get one honorable mention in this blog? Think again; because the Beinecke Rare Book and Manuscript Library deserves its own special praise. The Beinecke Rare Book and Manuscript Library is an amazing sight to behold. Resembling a large ice cube tray from the outside, one would not guess that this building contains one of the largest collection of rare books and manuscripts in the world. These titles are so rare that the entire building is made of translucent veined marble and granite which naturally filters out the sun's damaging rays while still flooding the hall with a warm yellow glow. The books housed in Beinecke are so rare that visitors are not allowed to touch them. All titles are held in a pressure controlled tower of glass within the building. You can see, but don’t touch. If you do want to read a title, a librarian will help you view copies or look over passages in a specialized setting. Why is it that ivy league schools have the best libraries? Our post-secondary theme continues with the Bodleian Library. This work of art is located in Oxford, across the pond in England on the grounds of the famous University of Oxford. As one of the oldest libraries in Europe, the Bodleian Library plays home to over 12 million titles. The library first opened to scholars in 1602 and continues to play host to thousands of academics young and old, to this day. Next up on our European tour is the British Library! Known as the largest national library in the world, the British Library houses somewhere between 150-200 million items. But these items aren’t limited to the UK in origin; the British Library boasts artifacts and texts from all across the world. Included among these artifacts is the world's earliest dated printed book, the Diamond Sutra! On average, over 16,000 people visit the British Library each day. The Melbourne Public Library, also known as the State Library of Victoria, was first established in 1853 with the first building opening in 1856. Back in those days, it was decided that admission would be free as long as a person was over 14 years of age and had washed their hands. Pretty reasonable requests, if you ask us. The library is Australia’s oldest public library and one of the very first public libraries in the world. The library is home to both books and articles of historical and cultural significance to Victoria's heritage. Lovingly referred to as the black diamond by the sea, the Royal Danish Library is actually a collection of libraries now housed under one name. What used to be the State and University Library in Aarhus and The Royal Library in Copenhagen have merged with the Danish National Art Library and the Administrative Library to now simply be called the Royal Danish Library. This merger came into effect in early January of 2017 and has resulted in a massive, must-see library experience. While the collective is now referred to as a single “Royal Danish Library” the network of locations is breathtaking, and each one offers something different. When it comes to the best libraries in the world, these seven are sure to top many lists. If visiting any of these bookish destinations isn’t in your budget right now, you can still bring the classic scents of these scholarly halls into your house with our book themed candles. With scents like Oxford Library and Old Books, you can pretend you’re in your favorite library any time you want. Check out our bookish merch as well to add a flair of biblio-style to any space!